Wednesday was rock night on "American Idol", or as Ryan Seacrest described it, "No ballads, no slow dancing, just solid beats that will get you on your feet." Rock music hasn't been described as "solid beats that will get you on your feet" since the days of "American Bandstand," but this is "Idol," not a dingy rock club on the rough side of town. The playlist wasn't quite "Headbanger's Ball" — there were two Billy Joel songs in the mix — and only Angie Miller's show-closing spin on Evanescence's "Bring Me to Life" came close to actually, well, rocking. But the theme weeks are more about testing the contestants' resolve and seeing how they adapt to curveballs than they are about pleasing genre purists. In that respect, Amber Holcomb won the night with her fiery version of Heart's "What About Love," which earned a three-quarter standing ovation from the judges. (It takes a lot to get Mariah Carey out of her seat, as viewers have learned this season.) Holcomb was complimented by the judges for staying herself in the song and not getting lost or swallowed up by the week's theme. "Love, love, love this performance," raved Randy Jackson, while Nicki Minaj told her, "I think this has to be my favorite of the night so far." Kree Harrison also impressed the judges with her version of Janis Joplin's "Piece of My Heart," a song that might be nearing "Idol" retirement status. (It has been performed on the show in six previous seasons.) Harrison did the song while staving off the pain from a pinched nerve, which earned her a "10 out of 10" for professionalism from Keith Urban. Minaj told her that her voice was "unmatched" and Jackson gave her one of his patented "in it to win it!" remarks. Janelle Arthur took Billy Joel's "You May Be Right" and spun it into a country number, earning as many compliments for her cowboy boots as she did for her vocals. Both Urban and Jackson called her a "contender" and Mariah Carey and Nicki both praised her ability to relate to viewers. "Girls will love you; you feel like every girl's best friend," Minaj noted. After Candice Glover's take on the Rolling Stones' "(I Can't Get No) Satisfaction," Jackson compared her style to Tina Turner. But not everyone was impressed. "I fell asleep with that song," Nicki complained. 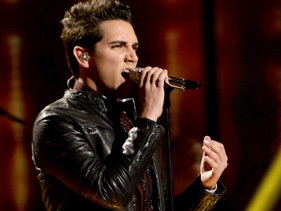 Lazaro Arbos, coming off a rough couple of weeks on the show, bounced back slightly with his version of Queen's "We Are the Champions," which had Nicki Merengue dancing in her chair. "It was crack juice," Nicki told him, sending the phrase "crack juice" to trending-topic status. She compared his vibe to Ricky Martin. Even Jackson, who has been tough on Arbos, told him, "Dude, you did a good job, I gotta give you props." Burnell Taylor struggled the most, and was swallowed up by Bon Jovi's "You Give Love a Bad Name" in the show-opening performance. Taylor, an R&B balladeer, was the victim of the night's worst song choice, and wasn't able to do anything to spin the song into his own style. Urban said he looked "uncomfortable" during the song and Jackson told him he has to learn how to do uptempo songs, but Minaj and Carey were easier on him, complimenting his effort. Taylor was better on his duet with Glover, one of three duo or group performances during the night. Will it save him? Viewers will find out Thursday, which is also set to feature performances by Carrie Underwood and Casey James.